TMS Software has a mapping component called WebGMaps which wraps the Google Maps API up into a Delphi XE5 control for Firemonkey. It runs on both IOS and Android so being cross platform is a big plus. It is a commercial component. It is based on a web browser control but all of the API functionality is provided for you as a component. You will still need a Google Maps API from Google key to use the component. For business users the license from Google to use the Google Maps API is pretty expensive. You’ll have to check out the Google licensing for yourself to see if it fits in your needs. I don’t believe WebGMaps supports offline caching so that maps it an online only component. Some of the other mapping components available for Firemonkey allow offline caching and in a mobile environment you may need that for your application. 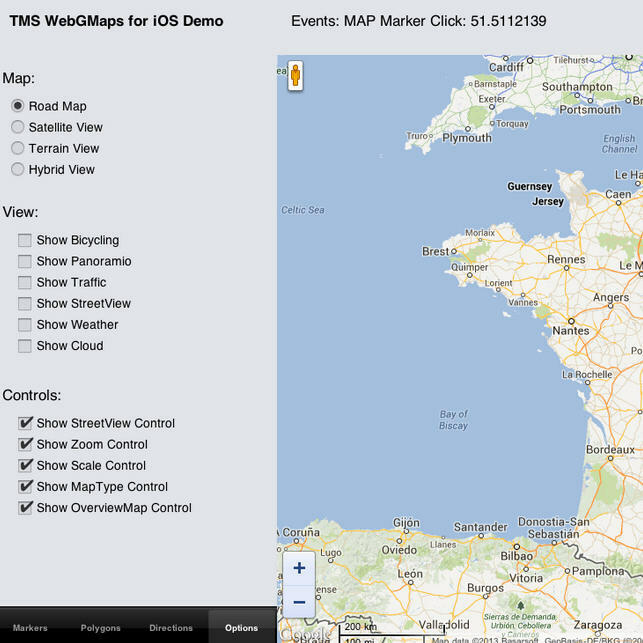 Download the demo of TMS WebGMaps over on their website.